This series consists predominantly of the meeting minutes, agenda, notes, and supporting documents circulated for review or discussion of the NDP's Table Officers, Provincial Executive, and Provincial Council. Outside of the Provincial NDP Convention, these three bodies comprise the most important governing bodies of the Party. The Table Officers include the Party President, two Vice presidents, the Party Leader, the Provincial Secretary, and the Treasurer. Table Officers would meet regularly, sometimes more than once a week via teleconference, to manage the strategic direction and positioning of the Party, discussing relevant breaking news, campaign strategy, public messaging, budgetary considerations, and party operations. Each member was charged with specific executive tasks, and would prepare reports on their activities for the Provincial Executive and Provincial Council. The Provincial Council acts as the Party's broadest governing body between conventions, able to deliberate and vote on motions sent from Convention for review and further discussion, and/or emergency motions that cannot wait until the next Convention. Council was comprised of all Executive members, as well as an elected delegate from each constituency association, and representatives from the YND and "affiliated organizations" (file 430-09). Council would meet less frequently, usually 4 times a year, to make policy decisions, set Party budgets, allocate revenue sharing strategies, share constituency reports, and assess the Party's direction, among other activities. These files contain minutes, agenda, policy documents, media clippings, financial statements, strategy documents, memoranda, correspondence, copies of court documents, public communications, resolutions, handwritten notes and drafts, and other related materials. These files appear to have been predominantly created by the Provincial Secretary who, as a member of all three decision-making bodies and based in the Provincial Office, would regularly keep diligent records of the meetings of each. Record-keeping practices vary slightly over time, depending on the Provincial Secretary (as do file-naming conventions), though generally, boxes received tended to contain records from each of the three bodies clustered into groupings over a single year. 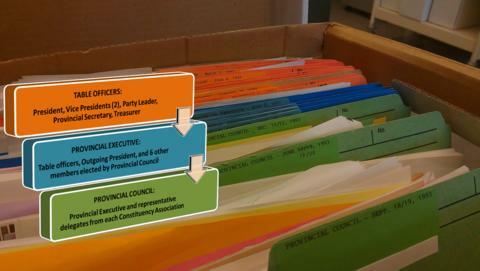 Though the standing committees often had representatives on the Provincial Council, their records were received separately and have been maintained as such in this arrangement. Files have been maintained in the order received, though boxes received were ordered into a rough chronology before processing when possible. Items in these files sometimes duplicate materials found elsewhere in the fonds, and often duplicate items found within the series in adjacent files. To preserve the evidential value of the series, these files have been maintained. Access to files 439-13, 443-08, 446-03, and 447-22 is restricted until 2112 due to the presence of personally identifying information. The attached digital image, created by the arranging archivist at Rare Books and Special Collections to assist researchers, is based on information taken from the CCF party constitution in file 436-02 (1949); though the Executive and Council expanded over time to include other representatives, little else changed in terms of the structure and makeup of these bodies over the next 40 years. (for information on the make-up of each body over time, see the NDP constitution books regularly included in the annual convention kits, in the "Convention records" series). The photograph also displays the received state of records now housed in boxes 440 and 441; these were the most organized records received within the 2011 accrual to the fonds. Audio and video cassettes are located in the following files: 443-16, 443-19, 444-03, 444-04, and 445-16.